If you’ve been tuning into the latest news, odds are that you’ve heard about 3D printing. Paul Markillie of The Economist declared it the “third industrial revolution.” Dr. Sanjay Gupta of CNN referred to it as “game-changing technology.” Even Pres. Barack Obama celebrated 3D printing, christening it as the “next revolution in manufacturing” during his State of the Union address. There’s no denying it: 3D printing is having a major impact–one that consumers are increasingly able to enjoy. Here’s Linkyo Insights’ brief, simple explanation to the ins and outs of 3D printing. The model stage has the user 3D modeling the object he wants to print. The user does this with a computer-aided design (CAD) program. He or she can develop the model by scratch or by downloading a pre-developed blueprint from a website, such as Thingiverse. This model is then converted into an STL (stereolithography) file. With the slice stage, a program called a slicer remodels the STL file by dividing the object into layers (“slices”). 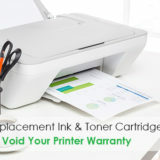 Remember that a printer works by producing layer upon layer until those layers become a complete object. The higher the resolution, the smaller the layer and the more precise the overall object. After the STL model has been sliced, a fixup program checks the model and corrects it of any errors. Once that’s done, the print phase begins. The filament is to a 3D printer what ink and toner are to 2D printers. Filament is commonly made of a plastic thread wrapped around a spool, but it can also be made up of other materials. The extruder is the component that delivers (“extrudes”) the filament to the hot-end, the nozzle section. 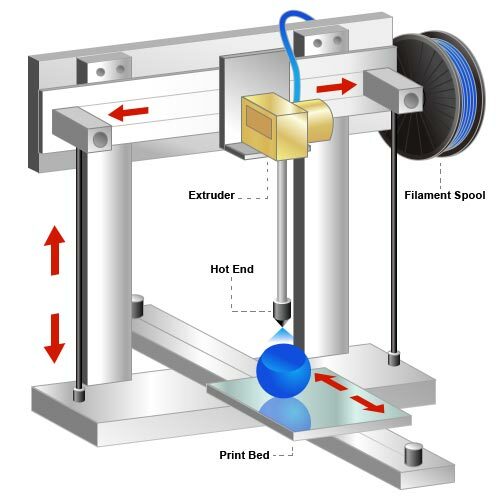 (The extruder and hot-end are often combined.) The filament is then produced in layers on the print bed. ABS is the most common type of plastic filament. PLA is a runner-up, being both biodegradable and available in soft or hard form. PVA, a dissolvable substance found in lubricants and adhesives, has a small, but growing, niche. 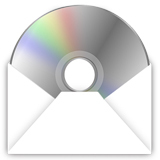 PC, used in media discs and bullet-resistant glass, is still in the developmental stage. HDPE, a type of moisture-resistant cheap plastic found in bottles and pipes, has little use because of its proneness to warping and shrinkage. 3D printers measure resolution by tenths to hundredths of a millimeter (mm). The more minute the resolution, the longer the printing process. A small object set at 0.3 mm resolution may take 15 min., while the same object may take 3 hrs. to print when set at a 0.1 mm resolution. Of course, it takes a capable printer to put out such a precise resolution–in other words, it costs more money. The good news is that the cost of 3D printers has come down considerably, ranging from $400 for the compact (and disassembled) Printrbot, Jr. to nearly $4,400 for the comparatively large 3DTouch. The median range for major printers is $1,200 to $1,500. Plastic filament, the cheapest and most common type, retails for around $40-$50 per kilogram (about 2.2 lbs.). The 3D printer market has grown tremendously, with dozens of serious offerings now on the market. CNET and Make Magazine both rank the $1,500 Afinia H-Series as their top pick, making special mention of the printer’s ease of setup and operation. Another top choice is the MakerBot Replicator, now in its second generation and retailing for $2,200.